After we finished recording at Brookwood Recording Studio in MI, we started driving east. Hour after hour, we drove through the night. In the dark, the hazy blue Appalachian Mountains were still beautiful: the view from the top of the ridges down to the city lights below in the valley was breathtaking. We kept driving, enjoying (?) the ice-storm damaged scenery once we finally arrived in South Carolina. It was nice to see green grass! Once we reached the coast, the beautiful beach houses on stilts became a common sight. 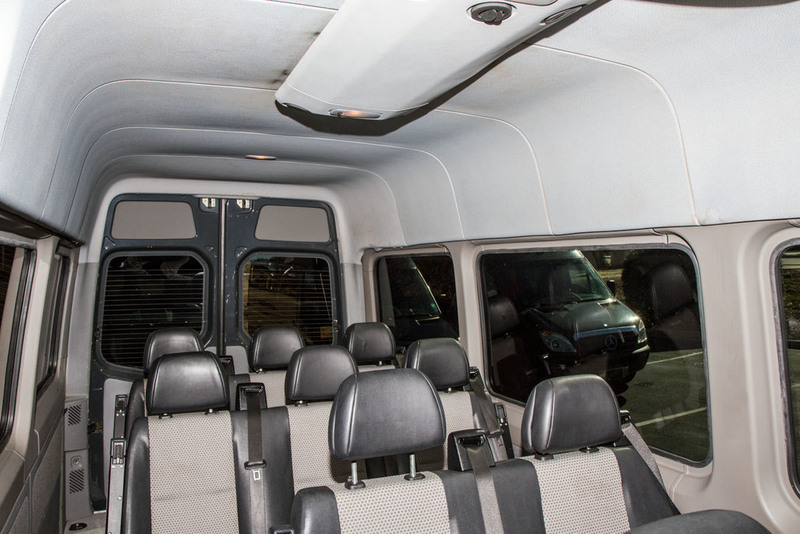 Our (new to us) Sprinter is tall enough for all of us to stand up in and will have much more space available to use on long trips! Notice the short sleeves of one smart guy! It was 82 degrees in North Carolina - a far cry from the sub-zero temperatures we've been experiencing! While test-driving the Sprinter, we stopped at the beach for an ultra quick 5 minute break before starting on the loooonnngggg drive home. At this beach on Sullivan's island, deadly currents and deep holes make it a requirement to stay out of water! It was posted that if you decide to disobey, you will be given a $1040 fine! We chose to stay out of the water. On the way back home, we enjoyed seeing the Appalachians again, this time during the day. The rock layers showing evidence of the world wide flood are an amazing sight! We drove for many more hours, with 4 of us in one vehicle and 4 in the other. This was one time we were thankful to have 5 drivers to share the driving responsibility! After driving for 26 hours straight, we finally stopped after dark at the Cumberland Inn (at Cumberland College) in Kentucky. As you can see from the pictures, the hotel was gorgeous and we had an absolutely wonderful time! The hotel even had letters from George H. Bush and Jimmy Carter on their walls from the college's 100th anniversary celebration 24 years ago. Next morning, it was back to driving again, past the black fences and black barns of Kentucky! After getting many more hours down the road near Indianapolis, Daddy took us to the Boulder Creek Dining Company for a wonderful lunch/supper at 3pm. Then the weather took a turn for the worse. First came strong, gusting winds around 60 mph, then torrential rain, and later a few ground level pink clouds! As we crossed the states, the rain turned to ice, and then freezing snowy stuff that sent both vans sliding around the road. Not fun. It makes for REALLY slow travel, especially with large vehicles that aren't weighed down. The last 80 miles took about 4 hours. In the evening, we stopped at the largest truck stop in the world and purchased an ice cream cake which we split up between vans and then devoured. South Carolina, North Carolina, Tennessee, Kentucky, Virginia, West Virginia, Ohio, Michigan, Indiana, Illinois, and finally Iowa! After almost 50 hours of driving time, we slid into our driveway at almost 3 AM Friday morning, very glad to be home. We were gone from Sunday afternoon until 3 AM Friday and that includes 2 days of recording to finish up the CD!